Welcome to The International Omaha, a spectacular horse jumping competition held in a city known for classic Midwestern charm and hospitality. Don’t take our word for it, get out and explore Omaha in between competitions. Here are a few exciting (and delicious) ideas to help you discover Omaha. 1. Explore one of the World&apos;s Best Zoo - In between trips through the world’s largest indoor desert and America’s largest indoor rainforest, explore the African Grasslands at Omaha’s Henry Doorly Zoo and Aquarium. Take in 28-acres of breathtaking panoramic views and long vistas teeming with African wildlife. It’s The Lion King come to life! 2. Something for the Carnivores - Omaha’s legendary steakhouses will keep your carnivorous cravings at bay as you start your steak pilgrimage here. Whether you want flame-broiled, whiskey-doused or wood fire-grilled – Omaha’s got you covered! 3. Shop, Eat, Drink, Repeat - A short walk from CenturyLink Center Omaha, the Old Market Entertainment District is buzzing with history and entertainment. Listen to the sounds from street musicians while strolling cobblestone streets lined with shops, pubs, and distinctive Omaha restaurants. 4. Taste the Original - Try the Reuben Sandwich on its home turf. Yep, it was invented in Omaha – we don’t care what those New Yorkers say. Reuben hot spots are sprinkled throughout the city, so pull up a seat and dig in! 5. Visit all 15 Giant Blue Push Pins - We’ve made it easy for visitors to find the fun in Omaha by "marking" 15 top Omaha attractions with giant blue push pins. Each attraction offers year-round, unique experiences that appeal to a wide range of interests. Download the pin map and visit all 15 locations. 6. Meet Bob! - He&apos;s Omaha’s most eligible bachelor and invites women to walk all over him! Actually... Bob is Omaha&apos;s tweeting, Instagramming, one-of-a-kind pedestrian bridge connected to more than 150 miles of trails. Chat with Bob at @BobTBridge. 7. Explore Omaha One Bite at a TIme - Perhaps the easiest way to take a bite out of the city is by hopping on an Omaha Culinary Tour. Omaha’s food scene is bursting with new flavors for you to sample, and these signature-tasting tours introduce you to unique culinary experiences. 8. Omaha Craft Brew Tour - We invite you to meet our makers. Omaha’s craft brew scene is one of the most buzzed about in the beer world. Taste what everyone is talking about, and create your own tour of Omaha’s craft breweries. Go to www.OmahaCraftBrew.com on your mobile device to plan your route. Cheers! 9. Get Your Art On - Interact with Omaha’s public art throughout the city. Pose with larger-than-life jugglers in front of Omaha’s downtown convention center, nearby see one of the country’s largest public murals, and watch out for a "stampede" rushing through the downtown area. 10. Get the Meat Sweats and Go Home Victorious - We will end this list with the mother of all beef challenges. Throw out the calorie counting and bite into the Stellanator – a massive meat mountain weighing in at 4.5lbs. and 4,900 calories. Few have finished the burger piled high with every possible burger topping (seriously…more people have been to the moon)! But wait – there’s more! 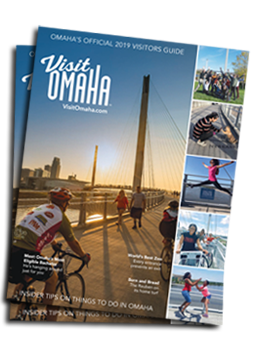 Check out other things to do in Omaha and start planning a memorable Omaha adventure.